Norfolk Island is a 10,000 hectare patch of Pacific paradise with rich volcanic soils, idyllic national parks and glorious beaches. The people of this island share the strong sense of community that is so sadly missing elsewhere in this trouble world. There is no imported fresh produce permitted here so the food producers on the island literally become stewards of their community’s health and many of the local growers have recognised the significance of their role. 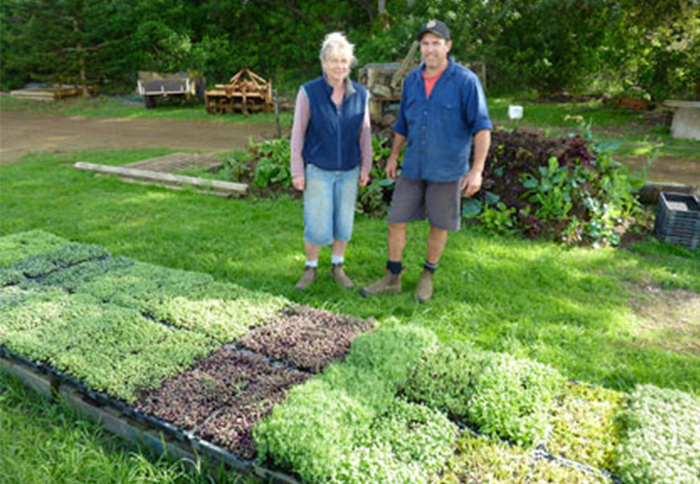 I have visited Norfolk Island several times over the last two years to educate the local producers about the benefits of biological agriculture. There is now a strong contingent of chemical-free growers on Norfolk and the island is poised to become a biological showpiece. I have become so enchanted with this place that I have recently purchased a farm with a view to producing medicinal herbs in some of the planet’s most mineralised soils. Matt Bigg is a proud Norfolk Islander who has attended several of my local seminars. He immediately recognised the significance of this new information and has since become an avid exponent of the art of growing fine food, free from contaminants. Matt has a great deal to share and he graciously agreed to this interview during my most recent visit. Graeme: Thanks for agreeing to share. I’ve watched your progress over the past couple of years and you have truly mastered this biological approach. What is your history? Was food production your chosen profession? Matt: It started out as a hobby. I actually trained as a mechanic but as the hobby grew I realised I could make a living from what I really enjoyed. I’ve had an interest in nutrition for some time and recognised the link to the soil. I was like fertile ground for the seeds you planted during your seminars because I was open to these ideas and ready to act upon them. I particularly responded to the scientific explanations of how and why things work. Graeme: I have been arguing for some time that the era of “get big or get out” is all but over in agriculture. We are at the dawn of a new era where the mantra may become “diversify or get out”. Peak oil will mean that food miles become increasingly important and there will be an inevitable move toward local and seasonal food sold at farmers' markets. It is possible to be profitable on quite small parcels of land if we select synergistic, multi-dimensional enterprises. You have certainly embraced that approach. I see that you have added free-range chooks to your many income streams. Matt: Yes, they have been a good inclusion. We now have over 250 hens and the eggs have proven really popular at the Farmers' Market. Graeme: I noticed the people lining up at last week’s market. They seem to be arriving earlier each week to avoid missing out on your produce. Matt: Yes, they are. There is a big rush for carrots as I’m the only grower with them at the moment. Graeme: How do the chooks sync with everything else you are doing? I’m a big fan of building permaculture principles into agriculture. Matt: Well the issue here is the cost of imported grain, so it is a good plan to try to reduce the reliance on cereals. We have vegetable scraps available every day and the chooks get the lot. Graeme: They certainly seem to love this food judging by the feeding frenzy I just witnessed down at their enclosure. You produce such mineralised and tasty vegetables there is no surprise that it would make fine chicken food. It is often suggested that chickens require a diet of at least 80% grain to maintain good egg production, but I have never been convinced that this is necessary if your greens are good enough. What percentage of your chook food is grain? Matt: I’m not sure of the exact figure but I would say they are getting less than 50% grain and that figure may drop further once they go onto the lucerne paddock. I’ve just prepared a paddock and am about to plant lucerne for them. They can be moved into that plot for a day or two every week and that will provide some supplemental protein. Graeme: That’s a good strategy. You might also try building some more diversity into their regular pasture. I have a friend who has over 40 plant species in his free-range pasture. 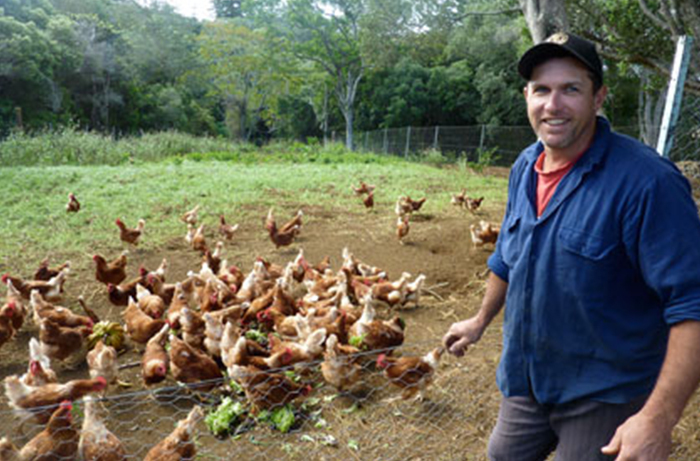 He claims that he is down to 20% grain and this makes the egg production very cost effective. It is a real eye opener to see the tissue analysis of various pasture plants that are often considered weeds. You will find that several of them have higher protein and relative feed value than lucerne, including so-called pest plants like dandelion. I always wondered why my chooks favoured dandelion over almost anything else, when I tossed weeds pulled from the lawn into the cage. Then I saw leaf analysis details for this plant. Dandelion has 20% more protein than lucerne, 80% higher relative feed value, 25% higher TDN, double the potassium and four times more iron than lucerne. Plantain and chicory are also good additions. Even nettle root has a very impressive analysis and you could also include a range of medicinal herbs. Eggs are one of the best possible foods (if they are not from caged birds) and you could produce a powerful medicinal package if you do it right. If you were to include a little flaxseed and some kelp in their diet, then you would have eggs packed with omega-3’s and iodine. Do the chooks provide any other benefits in the system? Matt: Yes, they do. I move the whole flock into a paddock at the end of the cropping cycle and they completely clean it up for me. Not only does it provide good food for them but their manure and the aeration from the soil scratching seems to give this area a big boost at the next planting. The manure from the roosting shed is also a good fertiliser, so there are several other benefits. Graeme: Is this addition proving to be profitable? Matt: I’m getting almost 60 cents an egg and selling as many as I can produce. In full production that is 1700 eggs a week so you do the sums! Production has fallen off a little in these cold conditions though. Graeme: You should try Stock Saver Vet™ to boost production. Humates seem to have tremendous unrecognised potential in this regard. We have had a published paper from China translated where the inclusion of humates in the feed increased egg production by 73%. Matt: I have a bag here at the moment so I will definitely try it. 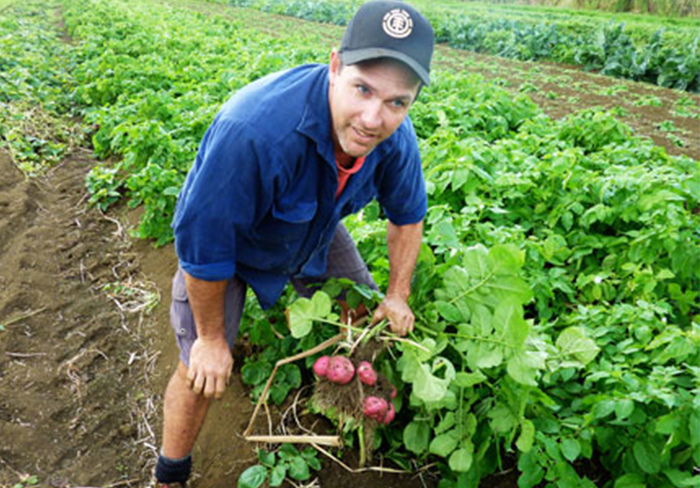 Graeme: What crops other than vegetables are you growing to maintain a good cash flow throughout the year? Matt: Well I have over a thousand banana plants as they are used as windbreaks between each of the cropping areas. I also have various citrus, passionfruit, pawpaw, avocados and stone fruit. The small crops include brassicas, root crops, corn, cucurbits and Asian greens and then there’s the hydroponics. Graeme: It’s a bit of an unusual combination to see a biological grower, who is producing some of the best quality produce I have ever seen, also growing a range of hydroponic crops. I often comment in my seminars that hydroponic produce is usually nitrate-packed crap that should be avoided at all times. I point out that brix levels in hydroponic lettuces rarely exceed 1.5 degrees brix, which is a measure of their total lack of nutritional value. Nitrates are the only form of nitrogen used in this production. Nitrates are always uptaken by the plant with water and this has an inevitable nutrient dilution effect. Nitrates are also carcinogens so this food has very little going for it. However you have worked to improve the brix levels of your hydroponic crops and you have succeeded in producing hydroponic food with up to four times the brix levels of conventional hydroponic crops. How have you achieved this? Matt: Yes, I’m aware that you are no fan of this food but I was convinced that it could be done better and I’ve done several things differently. I use foliar fertilisers regularly to introduce a full range of minerals through the leaf. I really like Triple Ten™ and Shuttle Seven™ for this purpose. I also use Hydro Shuttle™ and fulvic acid in the nutrient tanks to improve the uptake of all minerals. However, one of the most effective tricks is to bring in the biology. I brew Nutri-Life 4/20™ regularly and include it in the hydroponic solution. It seems to increase quality considerably. Graeme: Yes, this is a great strategy. The organisms in this product can survive well in the hydroponic solution. In fact they thrive amongst all of the minerals. These beneficial bugs include organisms that can fix nitrogen and they can help offset the nitrates that normally dominate. The organisms also improve the uptake of nutrients. Do you find you have to use many chemicals in the hydroponics operation? Matt: No, there is no need for either fungicides or insecticides so it is completely clean produce. I feel that the use of rainwater in the nutrient tanks is another important thing. It is pH neutral and free from contaminants. The micro greens have been another winner as we add them to our bagged lettuce mixes and they have proved popular. Graeme: Yes, I was really interested in this idea. I tried some of them when we had breakfast with the staff in your smoko room earlier and they were really delicious. Incidentally, it was great to see everyone sitting down to such a healthy morning snack. Those deep orange coloured eggs of yours on wholemeal toast and a bed of blanched spinach leaves served with tangy field tomatoes and these yummy micro greens. That’s the way to look after staff. Matt: Yes I have really good people working with me. They are so passionate about producing chemical-free food. Graeme: Yes they were saying that they feel good about coming to work each day. There is certainly no shortage of passion. For the benefit of the readers I will briefly explain the micro green concept. Most people will be aware of wheat grass and cereal grass, where these plants are harvested at a juvenile stage to provide an enzyme-packed health drink. These cereal juices that have become something of a phenomenon in recent years. Some therapists use wheatgrass as a principle component in the prevention and treatment of cancer. Well, the micro green concept is an extension of the wheatgrass idea in that the plants are harvested at the juvenile stage when they are most nutrient dense. However, in this case the plants involved are antioxidant-packed superfoods that actually contain a lot more than wheatgrass and taste a hell of a lot better. The different seeds are densely planted in trays in a special planting mix and the seedlings are cut at 3 to 4 weeks. There can be a second harvest but there is less than half the yield of the original cut. What are the species you are using as micro greens? Matt: I use kale, red cabbage, mesclun mix, yellow silverbeet, red chard, beetroot, Fijian pea feathers and watercress and we mix the micro greens in 150 gram packs with a variety of lettuce leaves. They are really popular in the supermarket, restaurants and farmers markets. Graeme: There’s no shortage of antioxidants in that mix. In fact, you have included the two vegetables with the highest antioxidant levels in watercress and kale and there is an abundance of anthocyanins, carotenes, chlorophyll and other protective compounds in these plants. They also offer a great deposit of enzymes similar to wheatgrass and most of us would benefit from extra enzymes to slow the withdrawal from our enzyme bank accounts. I think I might set up my own micro green trays at home after tasting yours. Moving on with the interview. What is your favoured nutrition program for the vegetable crops? Matt: I always start with a soil test and make any corrections that are needed. I’m starting to get soil ratings of four and a half out of five with my NTS Soil Therapy™ analysis so there is often not much to be done these days. Whether or not I need to apply correctives I always use a planting blend of Norfolk Gold™. 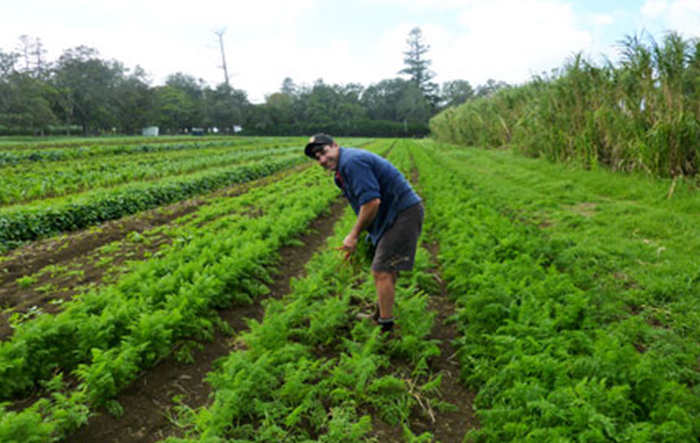 Graeme: For the benefit of those who do not know this fertiliser, it is an all-inclusive, composted fertiliser that includes all of the minerals that are commonly deficient on Norfolk Island. The Norfolk Government commissioned us to test most o the food producing soils on the island and we manufactured this specialist fertiliser on the basis of all of that soil test data. Sorry for interrupting, please continue with your program details. Matt: No problem. Norfolk Gold™ is a fantastic fertiliser so it obviously pays to put on what is needed rather than just throwing on NPK whether it’s needed or not. I use a lot of foliars in my program, usually every week something will go on but it is often a demand driven thing rather than rigidly following a timetable. The sort of things I use include Triple Ten™, Black Gold®, Tri-Kelp™, Molasses, K-Rich™, Shuttle Seven™, Cal-Tech™, Boron Shuttle™, Trio™, Dia-Life™ and Phos-Life™. Graeme: That pretty much covers everything you could possibly need. It’s good to see that you have some silica in you program in the form of Dia-Life™. Do you notice an increase in disease resistance associated with the use of silica? Matt: There definitely seems to be a benefit. There can sometimes be a problem, though with the use of micronised liquids like Dia-Life™ and Phos-Life™ on edible leaf crops as they can leave a residue that is hard to remove. Graeme: That’s true and for this reason we usually recommend the use of liquid silica products based on potassium silicate for foliar use. Do you also use microbial inoculums? Matt: Yes, I see them as a big part of biological Ag. Every season I apply three bacterial-dominated brews of Nutri-Life 4/20™ and three fungal-dominated brews of the same product. It is handy that you can select either version with the use of either Dominate™ product. I had the most amazing watermelon crop last summer with fantastic yields and flavour. I followed the NTS melon program exactly and it really delivered. I put on three brews of bacterial 4/20™ and used three applications of Tricho-Shield™. I also used Myco-Force™ and there were no chemicals needed. We achieved the equivalent of around eight tonnes per acre. Graeme: We checked out a good-looking carrot crop that was completely free of weeds earlier. Carrots are considered to be one of the hardest crops to grow without herbicides. Do you need to use herbicides for this crop? Matt: No, I can grow them without chemicals but timing is the secret. I plant four rows of carrots, 200 mm apart in an 800 mm wide strip. I use a walk-behind rickshaw weeder at 10 days after emergence and twice more during the crop cycle. Once the crop has developed, it blocks light to any weeds and there is usually little need for hand weeding. Graeme: Do you have any problem-solving tips in relation to specific pests that you would like to share? Matt: To be honest, I have to think hard to remember any problems. This biological approach is about keeping the plant healthy so it doesn’t succumb to disease and it really does work. It is just like the human body. If you do everything to stay healthy you don’t have any problems! The only problem I can think of at the moment is a bunch of quails that are eating the brassicas in one corner of the paddock. Graeme: Did you try Aloe vera to repel them? Matt: Yes, and it doesn’t seem to work with this species. Graeme: You could try a foliar spray of cayenne pepper with some Cloak™ Spray Oil to stick it on the leaf. Birds have a good memory. Once they have burnt their tongues they rarely return. To conclude this interview I wondered if you might like to summarise your philosophy and motivation for embracing biological agriculture. Matt: Well, it has a lot to do about how you feel about your chosen profession. I love what I’m doing because I’m proud to be producing food that will improve people’s health, food that I would happily feed to my own children. Food free from chemicals that can accumulate in the body over time (even when there are only tiny amounts of residue involved). There is a spiritual thing happening because I believe that you do unto others, as you would have them do unto you. I’m living my life to that rule and it makes me feel good. There is also something special about giving the plant what it needs and watching the response. You reap what you sow. Graeme: Thank you for your time. It was a special moment to see you scratching your head trying to think of a problem in a world where problem-solving chemicals contaminate most of our food. Keep up your wonderful work.